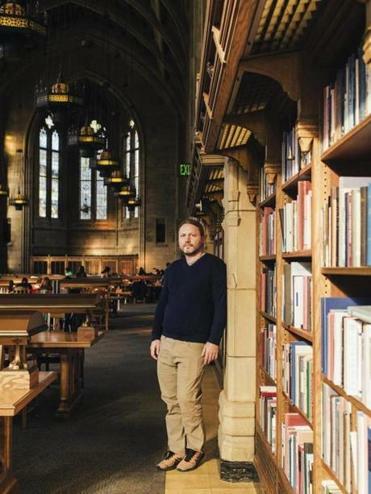 Luke Zettlemoyer, a professor at the University of Washington, at a campus library in Seattle. With so few artificial intelligence specialists available, big tech companies are hiring from academia, which in turn limits the number of professors who can teach the technology. Zettlemoyer turned down a lucrative offer from Google, instead taking a post at the nonprofit Allen Institute for Artificial Intelligence so he could continue teaching. SAN FRANCISCO — Silicon Valley’s startups have always had a recruiting advantage over the industry’s giants: Take a chance on us and we’ll give you an ownership stake that could make you rich if the company is successful. Now the tech industry’s race to embrace artificial intelligence may render that advantage moot — at least for the few prospective employees who know a lot about AI. Tech’s biggest companies are placing huge bets on artificial intelligence, banking on things ranging from face-scanning smartphones and conversational coffee-table gadgets to computerized health care and autonomous vehicles. As they chase this future, they are doling out salaries that are startling. Typical AI specialists, including both PhDs fresh out of school and people with less education and just a few years of experience, can be paid from $300,000 to $500,000 a year or more in salary and company stock, according to nine people who work for major tech companies or have entertained job offers from them. All of them requested anonymity because they did not want to damage their professional prospects. Well-known names in the AI field have received compensation in salary and shares in a company’s stock that total single- or double-digit millions over a four- or five-year period. And at some point they renew or negotiate a new contract. At the top end are executives with experience managing AI projects. In a court filing this year, Google revealed that one of the leaders of its self-driving-car division, Anthony Levandowski, a longtime employee who started with Google in 2007, took home more than $120 million in incentives before joining Uber last year. There are a few catalysts for the huge salaries. The auto industry is competing with Silicon Valley for the same experts who can help build self-driving cars. Giant tech companies like Facebook and Google also have plenty of money to throw around and problems that they think AI can help solve, like building digital assistants for smartphones and home gadgets and spotting offensive content. Most of all, there is a shortage of talent. In the entire world, fewer than 10,000 people have the skills necessary to tackle serious artificial intelligence research, according to Element AI, an independent lab in Montreal.